The Heuristic Testing Strategy Model Mindmap The Heuristic Testing Strategy Model Mindmap | That’s a Bug! Project Environment includes resources, constraints, and other elements in the project that may enable or hobble our testing. Sometimes a tester must challenge constraints, and sometimes accept them. Product Elements are things that you intend to test. Software is complex and invisible.Take care to cover all of it that matters, not just the parts that are easy to see. Quality Criteria are the rules, values, and sources that allow you as a tester to determine if the product has problems. Quality criteria are multidimensional and often hidden or self-contradictory. 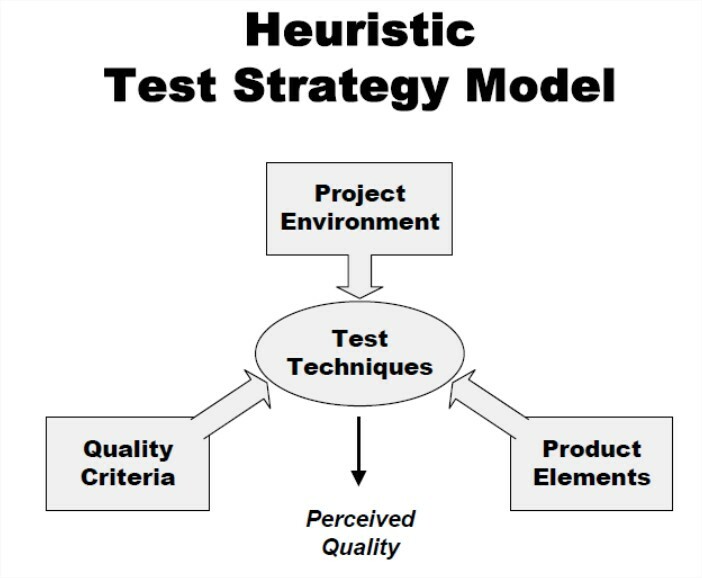 Test Techniques are heuristics for creating tests. All techniques involve some sort of analysis of project environment, product elements, and quality criteria. Perceived Quality is the result of testing. You can never know the “actual” quality of a software product, but through the application of a variety of tests, you can make an informed assessment of it. The 5-page paper which describes the HTSM can be found here. Since the HTSM is a tool for reflection and continuous improvement, I find very useful see it as a Mindmap, for it is more dynamic and “touchy” form of information organization. I have designed a mindmap which captures the information the aforementioned paper, joining some aspects and removing a few others. The intention is to, from time to time, improve upon this mindmap organization, adding, removing and topics. The mindmap, created using XMind, can be downloaded here.